Home » carbon reduction » CRC » energy efficiency » energy saving » environment agency » ESOS » scheme » variable speed drive » VSD » What are the differences between ESOS and CRC? 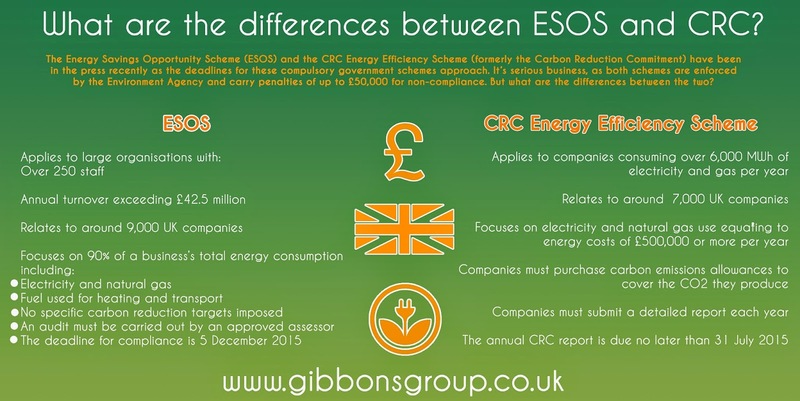 What are the differences between ESOS and CRC? The Energy Savings Opportunity Scheme (ESOS) and the CRC Energy Efficiency Scheme (formerly the Carbon Reduction Commitment) have been in the press recently as the deadlines for these compulsory government schemes approach. It’s serious business, as both schemes are enforced by the Environment Agency and carry penalties of up to £50,000 for non-compliance. But what are the differences between the two? We’ve got more information on ESOS, and if you’re interested in reducing the energy consumption of an electric motor-driven application, go to our variable-speed drives page. For any other enquiries give us a call on 01621 868138 or email info@gibbonsgroup.co.uk.